Welcome to Coral Tree Inn, we are a boutique resort-style hotel in the heart of Cairns, Queensland, Australia. Across from the newly transformed Munro Martin Parklands and close to all the shops, restaurants, theater, art galleries, casino and the railway station. With our quiet and convenient location, and our friendly and knowledgeable staff, we hope to make your time in Cairns pleasurable. If you are looking for relaxing, unpretentious and economical accommodation for your stay, look no further. Apartments at The White House Port Douglas is a delightful example of “Old Queenslander” architecture, nestled amid lush tropical gardens. A favourite for Port Douglas Holiday Apartments. Orchid Plaza Shopping Centre was built in 1985, as Cairns’ newest and most prestigious shopping complex. Launched with fanfare and to acclaim, the two-storey complex was a hub for locals and visitors alike, who appreciated the ambiance, design, convenient location and diversity of experiences available. The Woolshed is Famous Worldwide for its Great Value Meals, Table Dancing and the guaranteed party seven nights a week then gets wilder as the early hours wear on. Recently refurbished, the restaurant is on street level featuring an al fresco area, while the night club is upstairs, with the front opening onto a balcony overlooking the Fig Trees. Experience some of the best Accommodation Port Douglas has to offer. 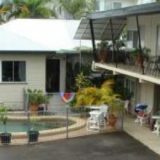 The Balboa Apartments are very spacious, fully self contained holiday accommodation adjacent to the famous Four Mile beach. For the perfect Port Douglas accommodation, Mandalay luxury beachfront apartments offer a unique foreshore location with all the facilities and services you expect from your holiday accommodation.